Clinton Kelly Inspired Chicken Thigh Osso Buco – What's for Dinner Moms? I can tell winter is on its way in when I see the sand/snow fences up at the beach. This is always a very sad sight for me because I know what is coming far too soon. The past two Halloween nights we have had snow or cold, icy rain. With Halloween only 3 weeks away it is too close! I love most of my time here in Southwest Michigan but I have to come to some sort of understanding with winter. We are still at odds right now. I like snow until Christmas. Then it can go. But, winter seems to hang on until April. That is not acceptable to me. After seeing this I knew that I needed some warming comfort food. I had taken out chicken thighs ($.49 a pound!) but what to do with them? So, I have learned that osso buco is usually veal shanks braised with vegetables. I don’t know about you but I am not going to find veal shanks at my local grocery store. As I was researching I ran across this recipe by Clinton Kelly of “The Chew” that uses chicken thighs rather than veal shanks. This is much more do-able for my family. But, I also had to change the recipe a bit for my family. Here is the link to the original recipe for Chicken Thigh Osso Buco with Creamy Polenta from Clinton Kelly (click for link to recipe). I didn’t have the makings for polenta or have any premade on hand. I also knew my family would want a bit more vegetables in theirs so I tweaked it a bit for my family. I hope you will do the same for yours. This was a delicious meal. The kids both commented on the smell as it was cooking and how hungry they were. I had both kids helping to make the meal so it cut down our prep time a bit. As my son was searing the chicken thighs in one pan my daughter was working on the sauce in a second pan. You can make this in one pan. Just remove the chicken after it is seared and cook the vegetables in the same skillet. I did it in two pans just to cut 10-15 minutes out of the time until dinner was on the table. Do whatever works best for you! I served this over mashed potatoes (just have your potatoes ready to boil as you allow the osso buco to simmer and they will be done about the same time) and a green side salad. I have said this is of moderate difficulty mostly because of the number of steps in the recipe. It is basic straight forward cooking but the number of steps can be intimidating for some. On a plate mix flour and Mortons Seasoning until well mixed. Dredge chicken in flour. In a large skillet (that has a cover) heat 2 tablespoons of olive oil over medium-high heat. When hot add 4-5 of the chicken thighs at a time. Sear each side making sure it is nicely browned. Remove chicken and set to the side. Lower heat to medium and add onion, celery and carrots to pan. Cook until carrots start to soften. Add tomato paste to pan. Stir well. Allow it to cook for 2-3 minutes until it darkens a bit. Pour wine into the pan and stir to combine. Allow the mixture to reduce by about 1/2. This will take about 5 minutes. Add chicken stock, thyme and rosemary to the pan. Stir well to combine. Add chicken thighs back to the pan and lower heat to medium-low and cover dish. Cook for 35-40 minutes until chicken has cooked through. Remove pan from heat. Let sit for 2-3 minutes before serving. Serve over mashed potatoes, if desired, with sauce over the top. 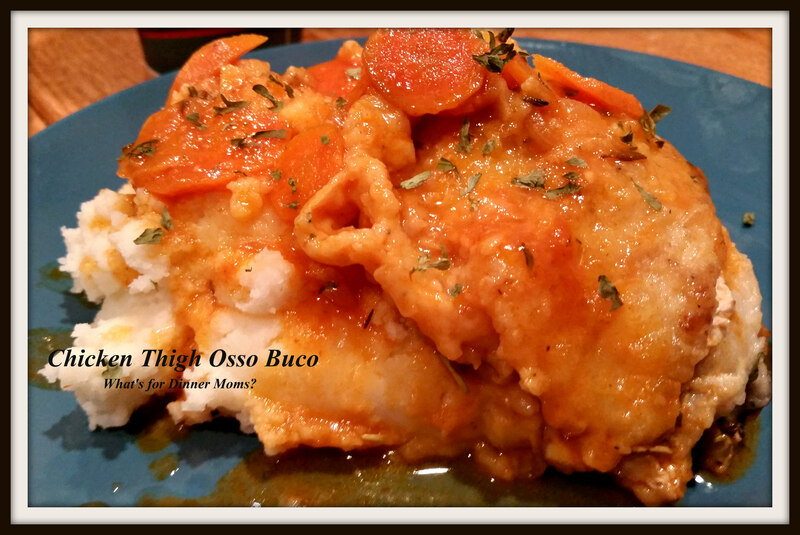 Oh our family loves Osso buco! I have used both veal and beef shanks. The family prefers beef shanks, but I like both. I usually make this dish for our Christmas dinner and serve it over pasta. Maybe you can find beef shanks easier than veal? I’ve printed this already thinking it will make a good alternative to the red mean version. Yummy, I will have to look for beef shanks. I have the butcher slice them in half b/c they tend to be SO thick. 🙂 They cook a bit faster too, and there’s more leftovers which are better the next day. oops! Red meat is what I meant to type! Shakes head…I really should have retaken typing 101. Lol. We all do it! Hope your family liked it a such as mine! This looks pretty darn easy to me, and must be so good! It really was! I said it was moderately difficult because of the number of steps but it was pretty straight forward.